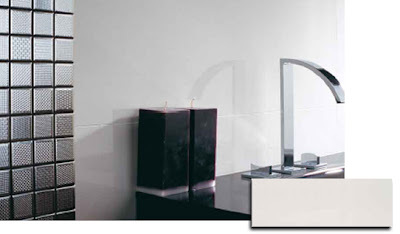 While we were out shopping for floor tiles for the powder room last week-end I came across a new line from Porcelanosa that would work great as a backsplash in a modern kitchen or bathroom. 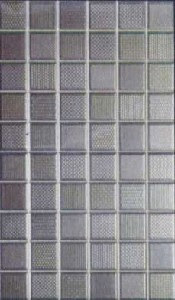 Mosaic Touch, available in Silver or Graphite colorways, are 12"x8" ceramic mosaic tiles like the ones I put in the boys' bath last year, but these shiny beauties look like patterned stainless steel. 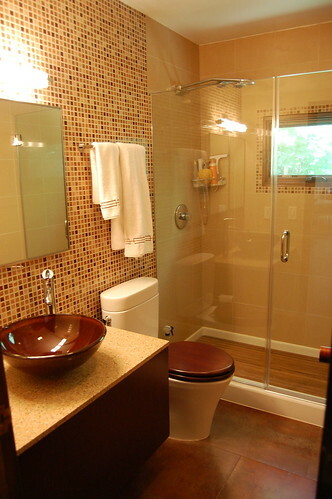 The advantages are the price, $6.50 per tile, and the ease of installation - just treat them like ordinary ceramic tiles, butter the back, stick them on the wall, pick a co-ordinating or contrasting grout, float it over, wipe it off and voila. It looks like mosaic but at half the cost and half the time.